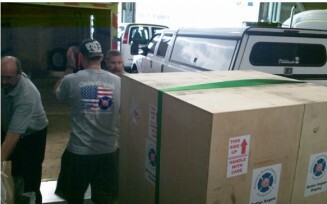 Better Angels has been in its crates since we left Clearwater Florida 4 weeks ago. One of these days I must take better pictures of the whole unloading, unpacking, assembling process but for now I only have these 2 not-so-good shots of the exhibit coming out of its trailer in Cincinnati. 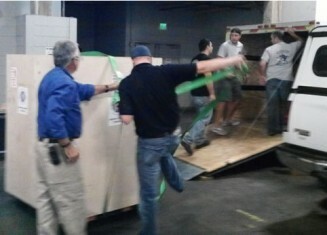 The paintings are in the big wooden crate. Now, as the holidays approach, it is time to count our blessings and look ahead. Thank you to everyone who has supported this project. Thank you to everyone who has come to share these paintings and who has helped us share them with others. Earlier this week the Better Angels Facebook page passed 300 friends, building a community. Thank you to those who help to spread the word. Our next scheduled stop for Better Angels is Firehouse World in San Diego in February. Our wish list also includes DENVER, CHICAGO and perhaps PHOENIX on our way to Indianapolis in late April. We are looking for secure public spaces where there would be no admission charge for visitors. I am particularly interested in bringing the paintings to Denver because Colorado is where I lived on 9/11 and where Better Angels began. Without early support from Boulder friends, the paintings might never have been. Of course, our wish list also includes NEW YORK CITY. Believe me, we are working on that. This entry was posted in Uncategorized and tagged 343, 9/11, better angels, FDNY, firefighter, firefighters, Firehouse World, LODD, memorial, NFFF, paintings, World Trade Center, WTC. Bookmark the permalink. We will always remember the heroes! !